Cancer is a devastating disease and it’s truly heartbreaking when it affects your beloved canine companion. As a pet owner, educating yourself about dog cancer can help you to catch the disease in its earlier stages and to provide your sick pet with the best care possible. Cancer occurs in dogs in a multitude of different forms, from liver cancer and kidney cancer to skin cancer and leukemia. With so many different types of canine cancer, it’s impossible to produce a single list of symptoms to check for when on the lookout for cancer. Rather, each type of cancer (such as Bladder cancer) has a separate collection of symptoms and warning signs that may arise when a dog is affected by a certain strain of the disease. While certain symptoms are common between several types of cancer, such as weight loss and loss of appetite, other signs are more unique to specific forms. One common type of this disease that occurs in canines is orophayngeal cancer, a type of mouth cancer. Weight loss and loss of appetite frequently occur in a case of this type of canine cancer, which most often affects dogs between the ages of seven and eleven years. Dogs suffering from orophayngeal cancer also often experience difficulty with chewing and swallowing. In addition, some dogs exhibit blood in their saliva. Lymphoma is another type of this disease that often causes weight loss and loss of appetite. This form of cancer can arise in many different parts of a dog’s body, including the lymph nodes, liver, and spleen. Other general symptoms of lymphoma include depression, vomiting, and fever. More specific symptoms depend upon the site and location of the lymphoma. Osteosarcoma, on the other hand, generally does not give rise to many symptoms in its early stages. This is a type of bone cancer which is often quite aggressive in dogs and most commonly affects larger breeds. Often, the only sign that something is wrong is an exhibition of lameness which tends to become progressively worse. Upon inspection, swelling and tenderness may be evident where the tumor is located. Other symptoms such as weight loss, trouble with breathing, and swollen lymph nodes often only show up in the more advanced stages of this disease. Another type of cancer which generally causes a different set of symptoms is mastocytoma. 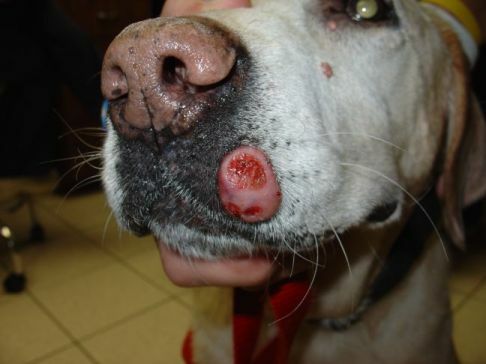 In dogs, this type of tumor most frequently occurs in the skin, although it can spread to several other parts of the body including the liver, spleen, and bone marrow. Most typically, this form of cancer causes lumps on the skin. These lumps can range from tiny nodules to softer and larger subcutaneous lumps. Occasionally, these lumps will appear as open sores and can be hairless or itchy. While certain warning signs such as loss of appetite and vomiting can occur in very aggressive cases where the tumor is extremely malignant, these symptoms are not as common with mastocytoma as with certain other types of cancer. It is clear that the warning signs and symptoms of canine cancer depend greatly upon the type of cancer present. However, certain signs that may indicate the presence of cancer in your dog include weight loss, loss of appetite, swelling or tenderness in certain areas, and lumps on the skin. If your dog is exhibiting unusual behavior or worrisome symptoms, it’s important to consult a veterinarian immediately. Since the signs and symptoms of canine cancer vary for the different types of the disease, diagnosing cancer is not always an easy task. In addition, many symptoms such as weight loss and loss of appetite, are very non-specific and do not help very much when it comes to identifying the problem that is affecting the canine patient’s health. As a result, special diagnostic tests and techniques are required in order to diagnose canine cancer and to identify the particular form of the disease that is present. Two of the most common techniques used in this regard are biopsies and radiography. A biopsy is a test which involves the removal of cells or tissues for examination. This examination is often conducted with the use of a microscope. In some circumstances, the cells or tissue are analyzed chemically. A needle aspiration biopsy involves the removal of cells by inserting a thin needle into a lump or other suspicious mass and withdrawing a sample. Other biopsies, on the other hand, are performed surgically. Such techniques are commonly used in the diagnosis of cancers such as lymphoma and mastocytoma, and can be very helpful with identifying and confirming the specific type of cancer present. X-ray, or survey radiography, is another diagnostic tool used with respect to canine cancer. In fact, it is probably the most common of such tools employed by veterinarians in this area. X-rays are very useful for identifying tumors or suspicious alterations in a dog’s body, allowing veterinarians to examine bone structure, tissue, and organs. While CT scans and Magnetic Resonance Imaging (MRI) are not commonly available in veterinary medicine, they are occasionally employed by larger veterinary hospitals and medical centers. Ultrasound is another diagnostic tool that can be helpful with the detection of cancer, especially in conjunction with other tools. If your canine companion is suffering from cancer, having a general understanding of this disease can help you to comprehend the situation and to assist your dog through this traumatizing experience. Basically, cancer occurs when the body is unable to recognize and destroy abnormally replicating cells as a result of a dysfunction on the part of the immune system. This disrupts the normal and healthy balance between cell death and cell growth. 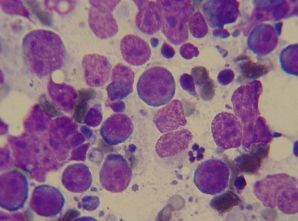 When unneeded cells continue to replicate in an abnormal and unregulated fashion, a mass known as a tumor will result. Many times when this sequence occurs the immune system will kick in quite quickly and overcome the tumor on its own. However, if the immune system continues to fail to respond to the situation, the tumor will grow and will eventually become problematic. Some tumors are known as benign tumors and do not cause much harm to the body, if any harm at all. These tumors tend to consist of cells which closely resemble healthy, normal cells. Contrary to these tumors, malignant tumors are those comprised of very abnormal cells that no longer resemble the healthy cells at all. These dangerous malignant tumors have a greater possibility of metastasizing, or spreading to other parts of the body, and are the ones that cause many types of cancer. Generally, the physical or outward appearance of the tumor will not reveal whether it is benign or malignant. This is where a biopsy can be an extremely useful diagnostic tool. Cancer is not caused by one single factor or influence. Genetics and environmental factors both play a role in the development of different types of this disease, and often a variety of factors are involved. Genetic influences that can increase a dog’s risk for cancer include inherited defects as well as acquired defects. Inherited genetic defects are frequently responsible for cancers that appear in young dogs and often involve a genetic mutation which either leads to the activation of a cancer-causing gene or the suppression of a gene that would normally control the replication of cancerous cells. Acquired genetic defects are not considered hereditary as they occur during embryogenesis. However, these types of defects are also responsible for early-onset cases of cancer, even where there is a lack of cancer in a dog’s family history. Carcinogens are also responsible for causing several types of cancer. Carcinogens can include toxic chemicals, radiation, and tumor viruses. These viruses can be either DNA or RNA viruses and infect previously healthy cells by integrating their DNA into the target cell, thereby altering the cell’s DNA. This now abnormal cell then becomes an oncogene and has the ability to cause cancer. It is also suspected that other factors, such as the immune system, have a hand in causing certain types of cancer. Suppressed or deficient immune systems, whether caused by old age or a medical condition, can increase a dog’s risk of developing some forms of this disease. In addition, it is thought that hormones may occasionally play a role in causing cancer. However, many factors may be responsible for the development of this disease in an individual dog, and pinpointing a specific cause may be difficult or impossible. There are many different treatment options available to fight canine cancer; however, the one which is most appropriate for your dog will depend upon the type of cancer present as well as other factors specifically associated with your individual pet. Surgery, radiation therapy, chemotherapy, and a variety of anti-cancer pharmaceuticals are all common treatments and one or more may be necessary for your canine companion. Since cancer tends to be a very aggressive disease, aggressive treatments are often required. However, there are certain measures that you can take to reduce the stress and debilitating impacts of both the symptoms of the disease and the treatment itself. For example, many cancers cause a type of malnutrition known as cancer cachexia. This is often characterized by severe loss of appetite, weight loss, and several other metabolic changes. In such cases, a special diet of food that is high in energy and easy for your pet to digest can greatly increase your dogs comfort, quality of life, and ability to withstand both the cancer and the treatment regime. In some cases, herbal or vitamin supplements can also be of help in a similar fashion. As your pet’s comfort and resilience are vital when dealing with cancer, it’s important to take care of your dog’s health as a whole. Consulting with a veterinarian on all aspects of your dog’s health and well being will help you to take care of your beloved friend and to give your dog the best chance at fighting back against this heartbreaking disease.